All true metalheads should go out and buy this album now. Since Anvil re-entered public consciousness following the success of Sacha ‘Teabag’ Gervasi’s heart warming film ‘Anvil – The Story of Anvil’, much has been written about why the band never made it to the big time back in the 1980’s. Was it down to the ambitious arrangements and less than stellar production on their third album ‘Forged In Fire’? Should they have let Jonny Z (the man behind Metallica and Overkill’s early success) manage their career instead of signing with big shot manager David Krebs of Aerosmith fame? Would Krebs have worked harder for the band if Robb hadn’t cost him a small fortune by insisting that he ship his entire drum kit to Japan for a tour? We will never know the answer to these and many other questions about why this hugely talented band - who along with fellow Canadians Exciter pioneered the whole speed metal movement in North America - never broke through. Maybe it was always supposed to be this way and Lips and Robbo’s dedication to the cause and their pact to rock together forever would eventually be rewarded when lady luck got round to dealing them a trump card. It’s just such a pity that this has come so late in their career. 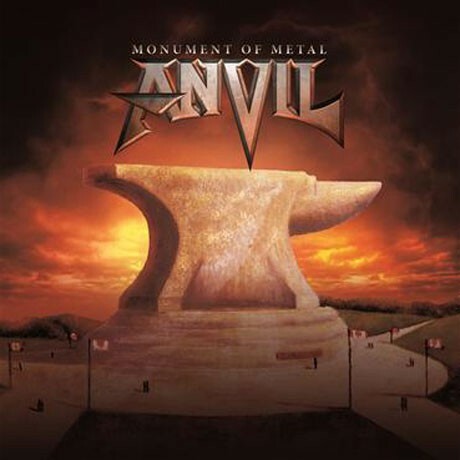 ‘Monument Of Metal’ is something of a celebration of Anvil’s heritage as the band themselves hand pick 19 of their all time favourites for your listening pleasure. And what a pleasure it is! Understandably their seminal ‘Metal On Metal’ opus features heavily accounting for six tracks in total. These are original, live or re-recorded versions of classics such as ‘Metal On Metal’, ‘666’, ‘Jackhammer’ as well as one of my all time favourites ‘March Of The Crabs’. Tellingly only one track from the aforementioned ‘Forged In Fire’ makes an appearance in the form of ‘Winged Assassins’. ‘Assassins’ has also had the re-recording treatment – sounding all the better for it - as has ‘School Love’ from their first album ‘Hard ‘N’ Heavy’. In addition, you get a track apiece from their recent albums ‘Juggernaut Of Justice’ and ‘This Is Thirteen’ as well as the NWOBHM prowess of the newly recorded oldie ‘Thumbhang’. The remainder of the tracks are made up of songs from Anvil’s wilderness years. Yes they lack the production sparkle of the others but they still rock like a mother with meaty riffs and pounding drums aplenty. If anything what’s lacking is a producer’s eye for detail on Lip’s vocals which in some cases fall a little below par. But who cares when you have slabs of metal like ‘Plenty Of Power’, ‘Bottom Feeder’, ‘Race Against Time’ and the old school trash attack of ‘Park that Truck’? I certainly don’t! All true metalheads should go out and buy this album now and pay some well overdue homage at the monument to this Canadian metal institution. Hail Anvil! May you indeed rock together forever!